Here, as promised, is my version of the cinnamon rolls that I spoke about last week. I'm immediately put off by anything that purports to be the best of kind, so I've decided to use an acronym to describe them and will leave the translation and ultimate grading to you. There is nothing original here. The rolls are cobbled together from various recipes and only slight changes have been made to the source from which the elements were stripped. The dough used to make the rolls is the creation of Susan Loomis. 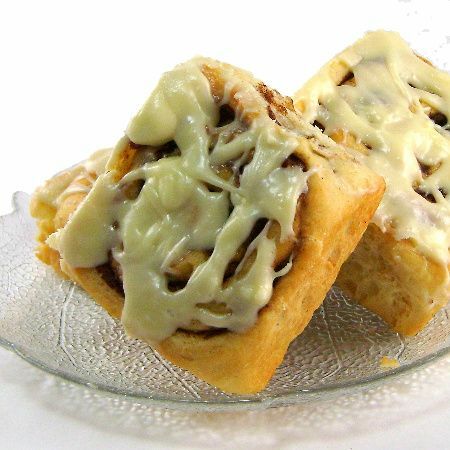 The spice mixture that fills them comes from Cook's Illustrated and the icing that crowns them is a clone of the one that's drizzled over Cinnabons. The rolls are meant to be a study in wretched excess, and if you make and sample them, I think you'll agree I've met my goal. The rolls take time to make but only because they rise so slowly. They are actually quite easy to assemble. I make the rolls the night before I plan to serve them and then rewarm and ice them just before they are put on the table. You'll notice I've shaped the rolls in two ways. One, of course, is the standard shape usually associated with the rolls. 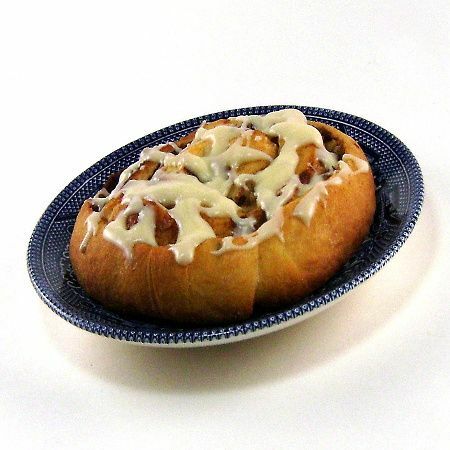 The other is a flattened form that resembles a baker's sweet roll or Danish. The flattened version is identical to the bun save for its shape and the time it takes to bake. The rolls stay fresh for up to two days if they are well-wrapped. They, of course, taste better when warm and just iced. Leftover rolls will be almost as good as new, if reheated in a microwave for about 15 seconds before serving. The rolls are perfect for a holiday breakfast or brunch. Here's the composite of recipes used to make them. 1) To make dough: Scald milk over medium-high heat. Pour it into large bowl of an electric mixer. Add butter and stir until butter has melted. Set aside until mixture is lukewarm. Stir yeast and sugar into milk. Add 1 cup flour and mix well. Add eggs, one at a time, beating well after each addition. Add salt and 1 more cup of flour. Mix vigorously until dough is smooth and elastic, about 3 minutes on medium speed. Add reserved 2-1/2 cups flour and mix just until incorporated. Turn dough onto a lightly floured surface. Continue kneading by hand until it is smooth. Place dough in a bowl, cover with a towel or plastic wrap and set aside until it has doubled in size, about 2 hours. 2) To make filling: Mix cinnamon and sugar in a small bowl. 3) To assemble rolls: Grease a 13 X 9-inch baking pan. Turn dough onto a well-floured surface. Roll dough with a rolling pin into an evenly shaped 12 x 16-inch rectangle. Brush dough liberally with softened butter. Sprinkle with an even layer of cinnamon sugar, leaving a 1/2-inch border along one of the long sides. Sprinkle with toasted pecans. Roll, beginning with long side of rectangle. Use finger tips to pinch dough as you roll, sealing edges firmly to form a seam. Cut into 12 pieces using a serrated knife or dental floss and arrange in pan. Cover loosely with plastic wrap and allow to rise until double in size, about 4 hours. 8) Preheat oven to 350 degrees F. 9) Bake rolls in center of oven until they are golden, 25 to 30 minutes. Invert rolls onto a wire rack and cool to room temperature, about 20 minutes. 4) To make icing: Mix all ingredients until smooth, adding more milk as required for drizzling. 5) To ice: Reinvert rolls and place rack over parchment or wax paper to catch drips. Drizzle icing over rolls with spoon. Cut or pull apart to separate. Serve warm. Yield: 12 rolls. Cook's Note: To make thinner rolls proceed as above, but press sliced rolls into disc shapes and place on 2 lightly greased baking sheets. Bake for 18 to 20 minutes.